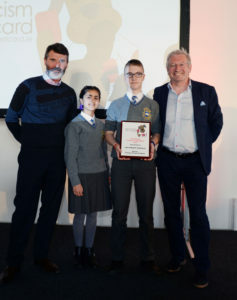 Football legend Roy Keane, Integration Minister David Stanton and the Mayor of South Dublin County Council, Guss O’Connell, presented awards today (02.05.17) to young people who developed creative ways to tackle racism. – The annual Show Racism the Red Card awards ceremony Tuesday, 2nd May, at 11.45am at Tallaght Stadium, Whitestown Way, Tallaght, Dublin 24. Pictured from left: Laya Susansabu, Andrew Tran, David Stanton TD, Minister of State at the Department of Justice and Equality,Chantelle Doyle, Roy Keane, Huimi Roy. 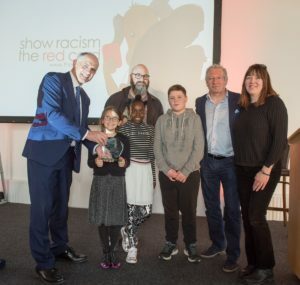 At the annual Show Racism the Red Card awards ceremony, which took place at Tallaght Stadium, Navan Educate Together scooped the top prize, for a video project developed jointly by pupils from 4th, 5th and 6th Class. 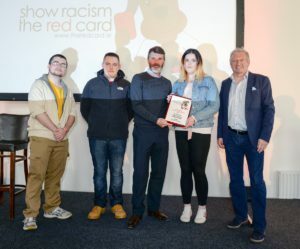 As part of their project, the pupils produced songs, poems and raps, and worked through Show Racism the Red Card’s school programme with their teachers. 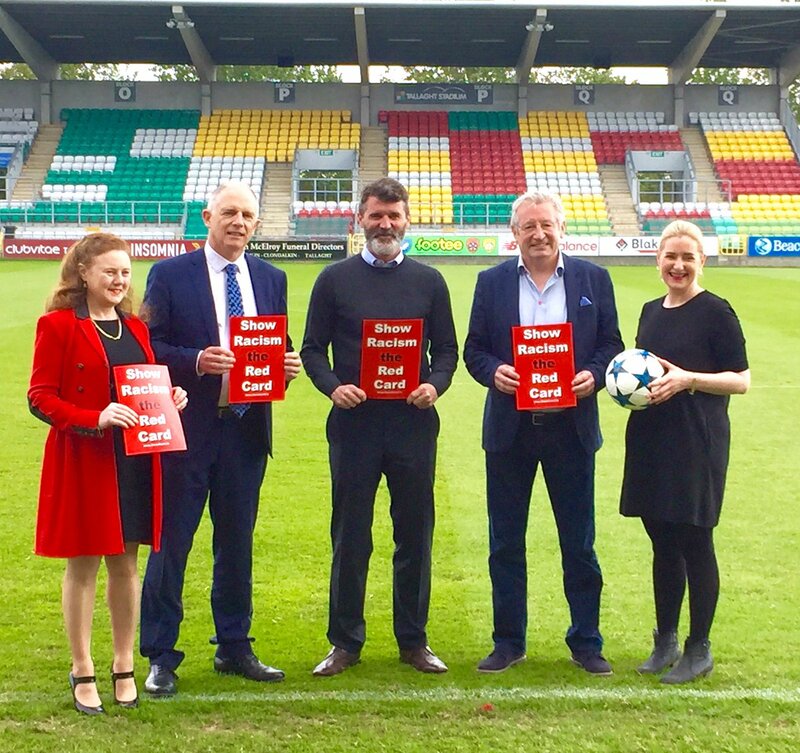 – The annual Show Racism the Red Card awards ceremony Tuesday, 2nd May, at 11.45am at Tallaght Stadium, Whitestown Way, Tallaght, Dublin 24. 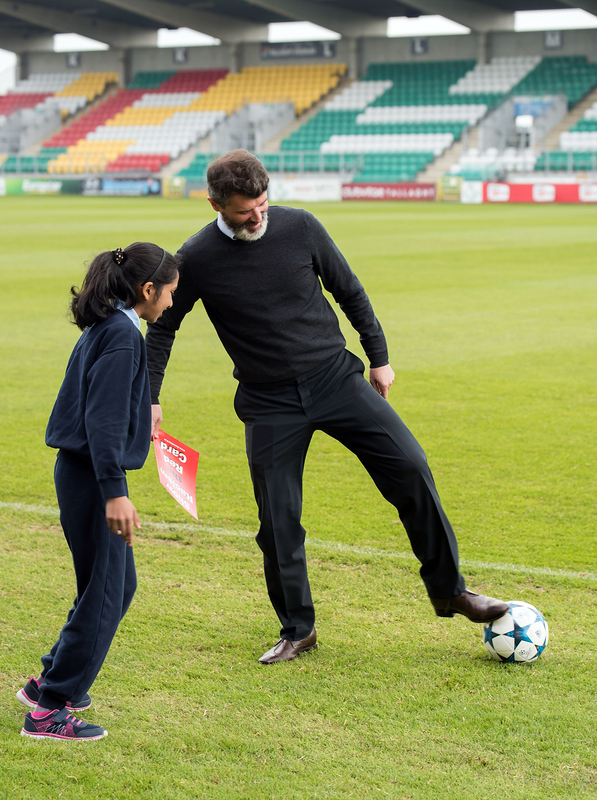 Pictured listening to Roy Keane is Philip Fitzgerald from Galway. 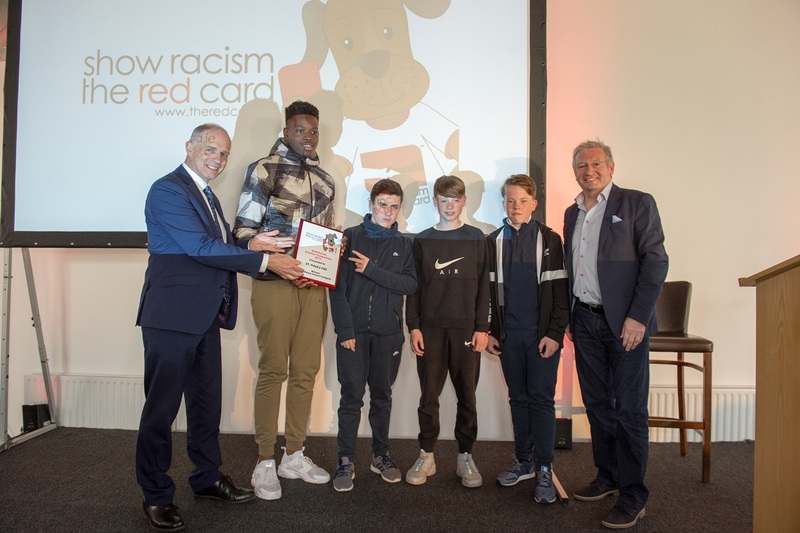 Show Racism the Red Card is a charity that uses sports and the high profile of sportspeople to tackle racism. The organisation holds an annual creative competition, calling on young people to develop creative messages about racism and integration. 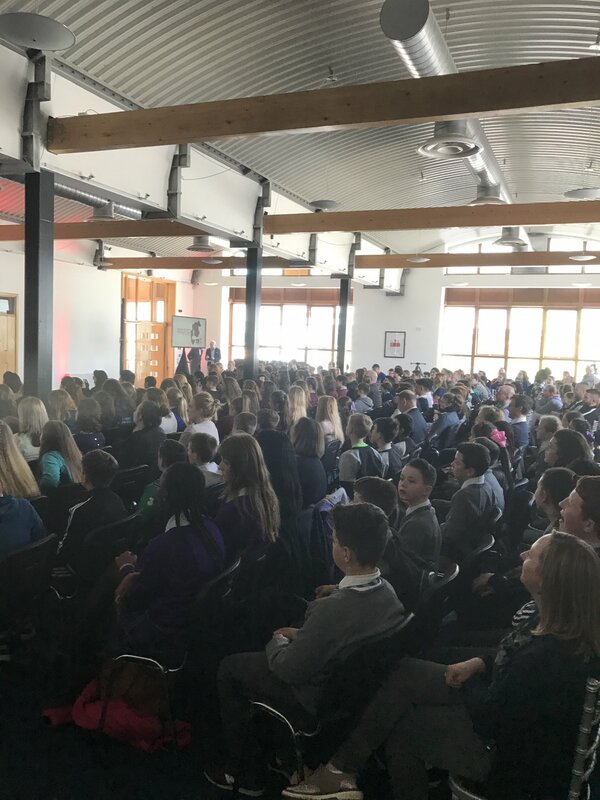 Three hundred young people from youth groups, Youthreach services, and primary and secondary schools attended the awards ceremony today. 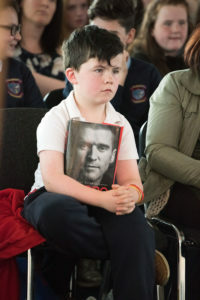 Other groups that received awards included young people from St. Paul’s CBS Brunswick Street in Dublin city centre; the CBS primary school in Dundalk, Co. Louth; and Youthreach Progression in Navan, Co. Meath. 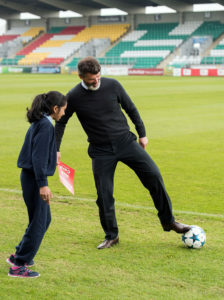 • Sports commentator Tony O’Donoghue. Speaking at the event, Minister Stanton said: “Show Racism the Red Card does excellent work in educating young people throughout Ireland about the importance of challenging racism and building positive intercultural relationships. “This is an area to which the Government is strongly committed. In recent months alone, the Tánaiste and I published the Migrant Integration Strategy to provide a framework for government action on migrant integration from now until 2020. We launched the Communities Integration Fund to assist community-based organisations to promote integration at local level. There is also a national scheme of funding to promote integration, as well as the EU Asylum, Migration and Integration Fund with anti-racism measures eligible under both of these. 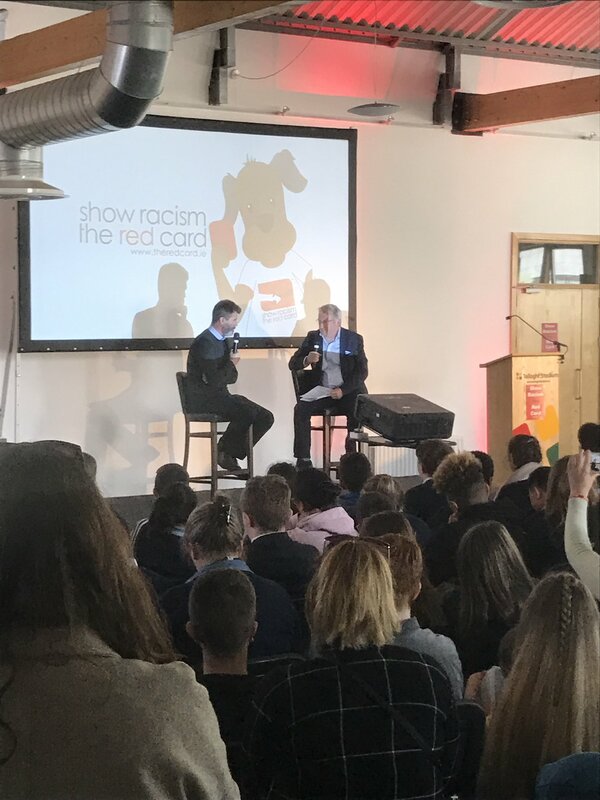 At today’s event, Garrett Mullan, Executive Director of Show Racism the Red Card, said it was “more important than ever before” for governments to show leadership in relation to tackling racism. 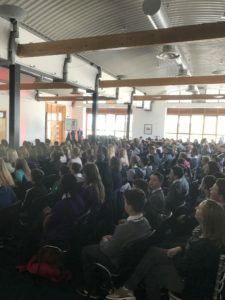 “Political developments over the past year have shown why it is hugely important to educate our young people about the need for tolerance, intercultural understanding and respect for differences,” he said. 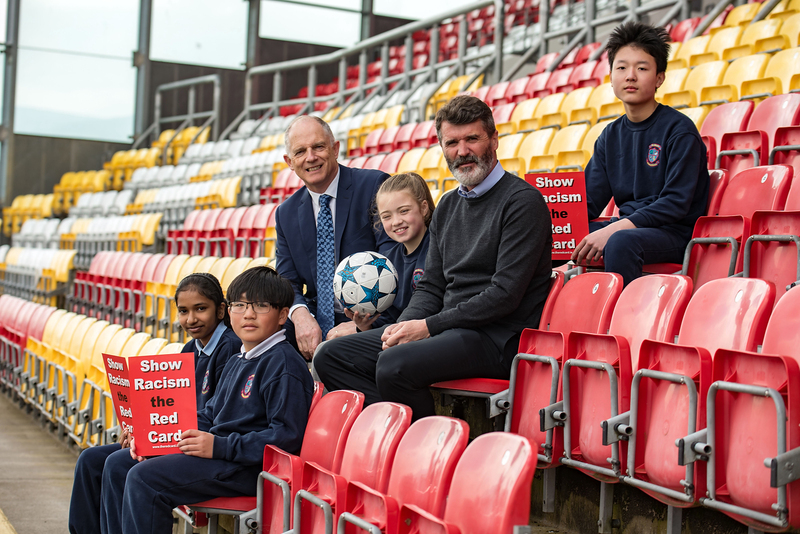 Mr. Mullan said it was heartening that 2017 saw the highest number of entries ever for the Show Racism the Red Card creative competition. Roy Keane presents the Youth Category award to Youthreach Progression Navan, also pictured is RTE’s Tony O’Donoghue. 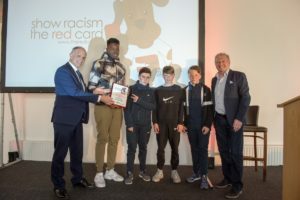 Show Racism the Red Card is an international anti-racism charity that was founded in the UK in 1995 with a £50 donation from Newcastle United’s Shaka Hislop. The Irish branch was established in 2006. The aim of Show Racism the Red Card is to harness the high profile of sportspeople to combat racism. The organisation works to produce anti-racism educational resources, and to educate young people through workshops and coaching activities. Further information is available at: www.theredcard.ie.